In the boreal zone of Eurasia, particularly in the Russian Federation and northern China, the number and extent of fires have been observed to increase over the last few years. During the first two weeks of April, 2003, numerous fires occurred in eastern Russia and northeast China, and produced a large amount of smoke that rose to form a thick layer of tiny atmospheric particles, or aerosols. 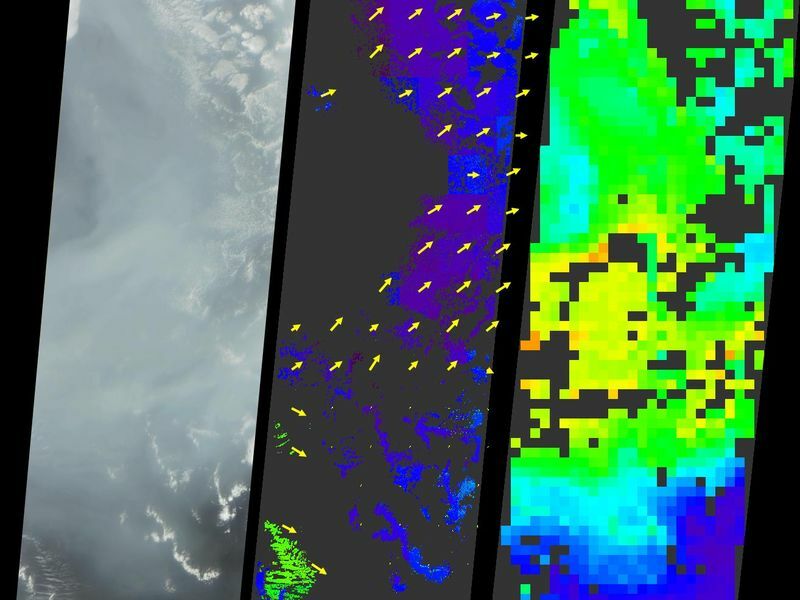 As these aerosols moved eastwards over the northern portion of the Pacific Ocean, the thickness of the smoke passing over an area south of the Aleutian Islands was measured by the Multi-angle Imaging SpectroRadiometer (MISR) aboard NASA's Terra satellite. At left is a natural-color image acquired by MISR's most obliquely forward-viewing camera. In this view, the pall of smoke causes the normally dark ocean water to appear significantly brighter. 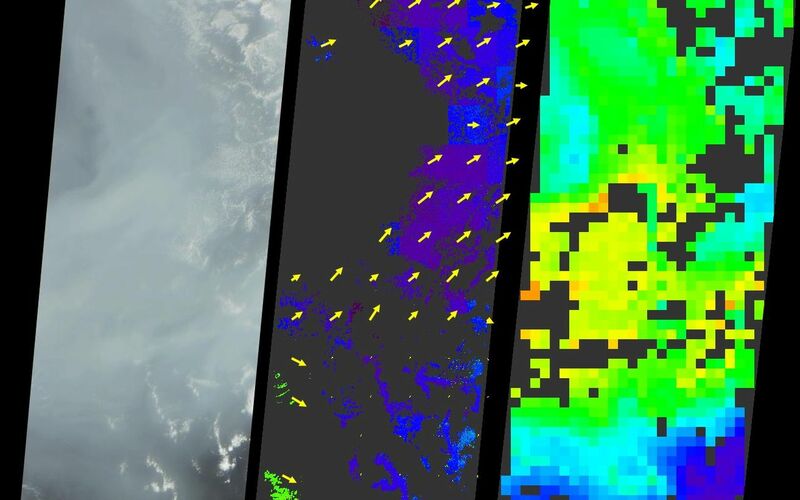 The center panel is a stereoscopically-derived height field for the clouds, with retrieved cloud-tracked wind vectors (indicated by the yellow arrows) superimposed over the height field. The vectors point in the direction of wind motion and their lengths are proportional to speed, with the longest vector corresponding to a wind speed of about 19 meters per second. 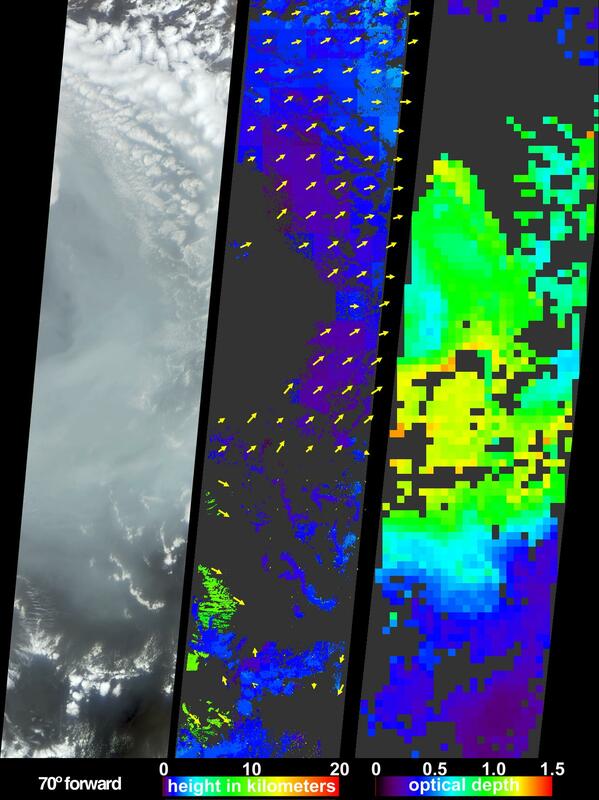 (Note that these vectors can represent winds associated with clouds at different altitudes.) The smoke exhibits very little spatial contrast and is not captured by the stereoscopic height and wind retrievals. However, the smoke is situated at a similar altitude to the low-level stratocumulus clouds, and the existing wind vectors indicate that winds at these altitudes blew generally from the west. The right-hand panel maps the abundance of aerosol particles as aerosol optical depth. MISR characterizes aerosols by the changes in the atmosphere's ability to transmit light at different view angles and by the variation in scene brightness, as well as by the spectral characteristics of aerosols. 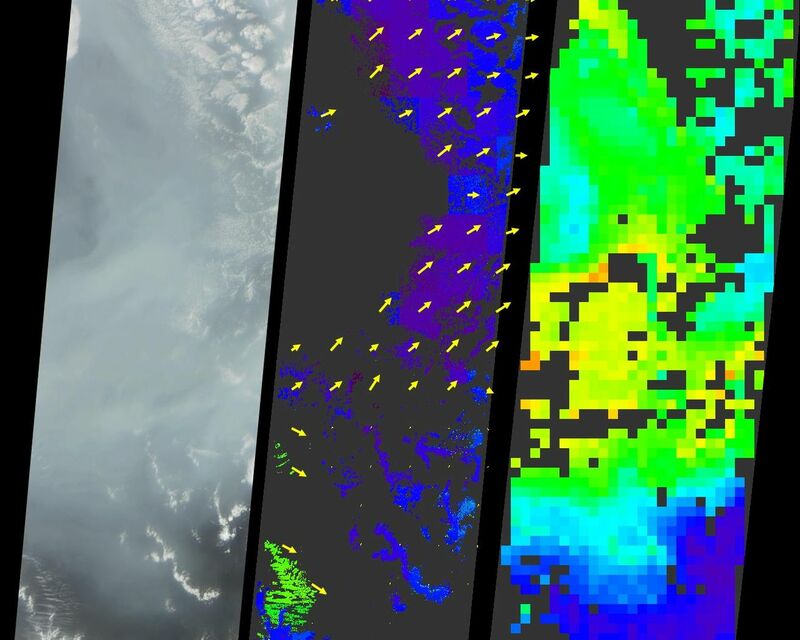 Higher optical depths corresponding with regions containing significant amounts of smoke are indicated by green, yellow and orange pixels, while clearer skies are indicated by the blue and purple pixels. Places where clouds or other factors precluded an aerosol retrieval are shown in dark gray. The three panels cover the same geographic area, which ranges in latitude from about 32° N to 47° N and traverses the international dateline from 171° E to 179° W.
The Multi-angle Imaging SpectroRadiometer observes the daylit Earth continuously from pole to pole, and every 9 days views the entire globe between 82 degrees north and 82 degrees south latitude. These data products were generated from a portion of the imagery acquired during Terra orbit 17644. The panels cover an area of approximately 400 kilometers x 1830 kilometers, and utilize data from blocks 52 to 64 within World Reference System-2 path 85.